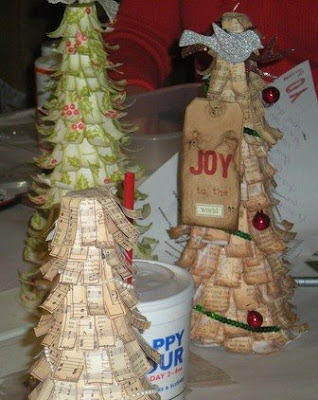 I may have mentioned before that I think that Maya Road chipboard can be used on just about anything. Here I inked my letters, lined them up very neatly in a cuttlebug embossing folder and then reinked. Then I threaded them through the swirl. One of the thinks that I like about using the cuttlebug on the chipboard is because it comes out so thin. For the full LO you can go to my blog. I am having a little contest. 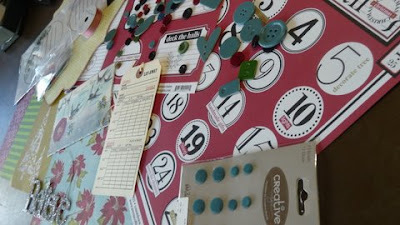 If you can name all the products used in the LO, I will give you a five dollar GC to The Crafty Scrapper. The store will be closed 12/31/08 and 1/1/09 all day. There is opportunity to crop on Friday the 1/2/09 from 10 am until midnight, but the store will not be open for regular business traffic that day until after 5pm. Please call the store to reserve a spot. The cost is $10.00 for the day at the store, or $5.00 from 6 to midnight. We will reopen for regular business on Saturday 1/3/09 with a new look in the windows, new product on the shelves and continued pleasure as we serve you-the best customers ever! OK......here is my window. I made it for my bedroom, so I didn't want to put pictures on it. 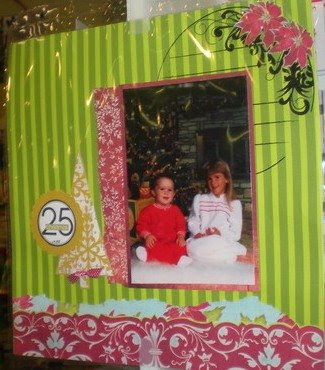 But they can be made with pictures, stamping, rubons are great, or mementos. I do not want to receive any emails about the lamp in this photo, YES I know its ugly, but my husband loves this lamp and its the one thing he is allowed to have up in the house, LOL! PS: We will be doing a class with windows in March...stay tuned. This is his little display he left for Santa, he insisted on leaving him one of every cookie....poor Santa! 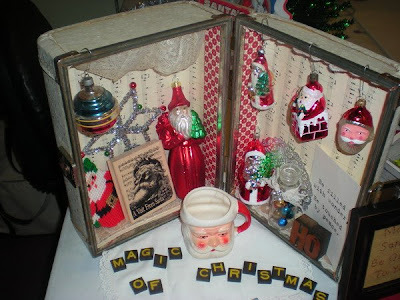 Tomorrow I will be posting pictures of my window....so stay tuned, it turned out just the way I pictured. On this day 17 years ago I was given the perfect gift of Marrying the woman I Love. I would not trade anything in the world to change one moment that has happened since that day. So today my love may we be as blessed as we were then. Just wanted everyone to know just how much I Love You. Happy Anniversary. Beleive it or not I have had time this year to make a few gifts. 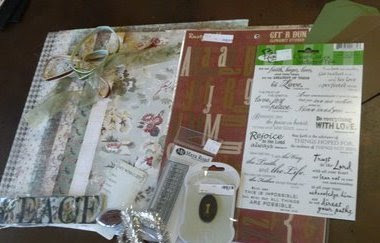 One thing I love to make are my own gift tags and gift certificate holders. I have been blending and inking like crazy since Wendy Veechi was here teaching. 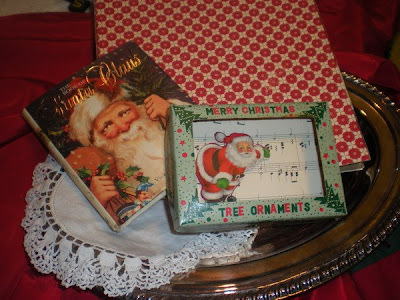 I made these gift card holders with the American Tag Company Tags, I used the large #10, inked it with faded jeans and fire brick distressing ink, then folded them, sewed it on the sides and stamped with Tim Holtz new Christmas stamps. There are some lucky employees getting these babies! 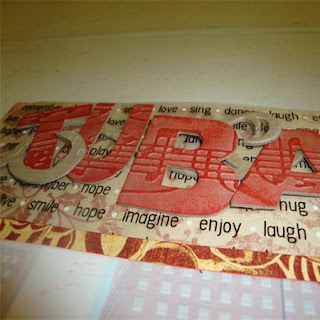 Heres a pictures of a gift one of my customers, Jennifer, made me. 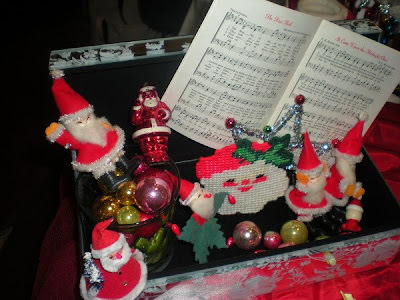 How cute is this, and my Santa picture fit perfectly...thanks Jennifer! I love these albums. They are the perfect size to be used as a datebook to fit in your purse. 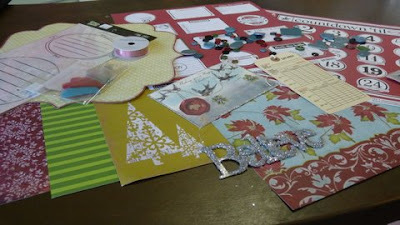 I used Andrea Gold's Forever and Ever Calendar templates and kits from After Five Designs. Sam's teacher really loved it. It was a fun hybrid project! What do you think I am up too? One hint...its going to be one of our 2009 classes! 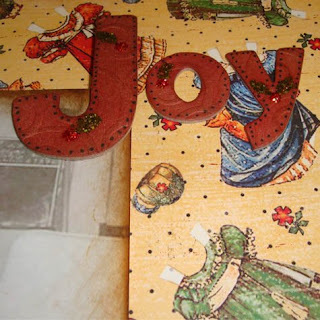 I may have mentioned before that I really love using the Cuttlebug and embossing the Maya Road chipboard. But now I have added another favorite, the distressed stickles. The peeled paint stickles were perfect for holly leaves. It added great sparkle with a little grunge. Just perfect. I have bought a few more to play around with. The rest of this LO is on my blog. Michelle made me this adorable reindeer Saturday at the crop. Its hard to see all the glitter, but trust me he is sparkling. Not only is this a special gift because its from Michelle, its also special because Michelle says never finishes anything at crops and this little guy she did....Thank you so much Michelle! It was a crazy, fun and buzy weekend and it has not slowed down yet. I wanted to share this picture of us, we did Santa pictures all day Saturday in downtown Waxahachie. Is he not the cutest Santa you ever saw? If you didn't get down for pictures, they will being doing them again this Saturday and Saturday Dec. 13th from noon-5pm. Pictures are $5, all proceeded go back into downton Waxahachie. Check back later this week. I left my camera at the shop, but I have pictures of a wonderful special gift a customer made me Saturday. Thats why I love the shop.....because I have the BEST customers!